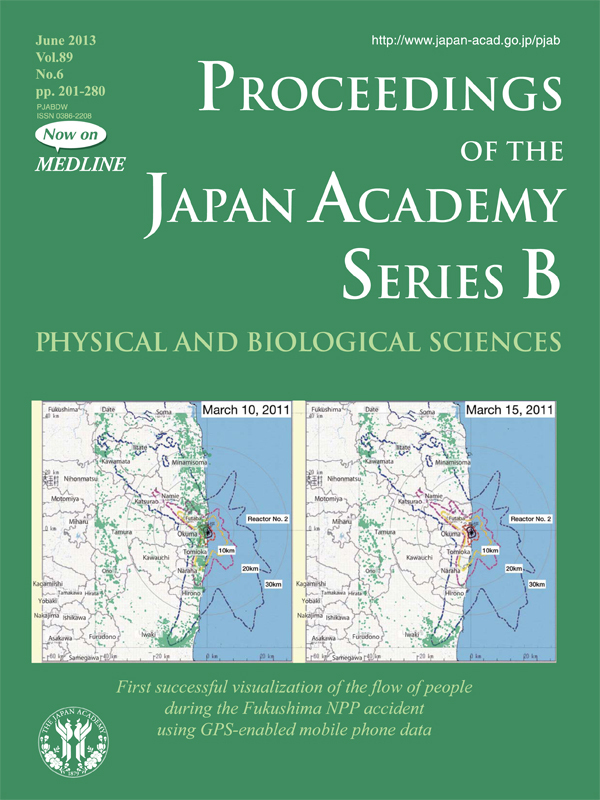 First successful visualization of the flow of people during the Fukushima NPP accident using GPS-enabled mobile phone data. 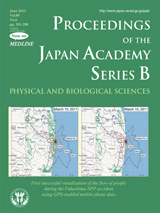 Followed by the Fukushima Daiichi Nuclear Power Plant accident, an enormous amount of radioactive evaporation and fallout took place, where great cares should have been taken to inhabitants, but there was no way to obtain useful information on the flow of people in and out of the highly contaminated region. To overcome this difficulty Hayano and Adachi (see the previous issue, Proc. Jpn. Acad., Ser. B 89 (2013) 196-199) created a new method to reconstruct a dynamical flow of people under such an accident. These illustrations show the geographical locations of people (green dots, 24-hour integrated) before (left) and after (right) the NPP accident, obtained by an analysis of GPS (Global Positioning System)-enabled mobile phone logs. So far, such data can only be collected by contacts with individual evacuees, as was done by the Fukushima Nuclear Accident Independent Investigation Commission. 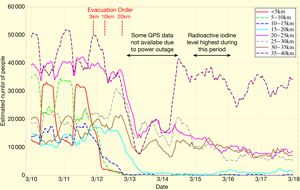 The present study has shown for the first time that GPS-enabled mobile phone data can be used to objectively visualize the flow of people during the Fukushima Dai-ichi NPP accident. The study shows that the number of people (green dots) within the 20 km evacuation zone (set by the Japanese government at 18:25 on March 12, 2011) was about 76,000 before the accident (left panel), and was decreased to about 2,000 at most on March 15 (right panel), when the atmospheric iodine-131 level was believed to be the highest. The inset on this rear page shows time evolution of populations in divided zones of every hour. The GPS-enabled mobile phone data, when combined with other data or simulation results, will greatly help in the reconstruction of early internal and external doses for the population as a whole.